Rubbish. Some people claim evolution isn't an accurate picture of how life developed because there aren't any transitional fossils--creatures that are half reptile and half bird, for instance. That's simply not true. There are many detailed examples of intermediate fossils. Perhaps the most famous fossils are from Archaeopteryx, which has the feathers and skeletal structure of birds and also features of dinosaurs. There's a whole (ahem) flock of other feathered fossils, more and less like birds. There's a whole sequence of fossils spanning the evolution of modern horses beginning with the tiny Eohippus. Whales had four-legged ancestors that walked on land, and creatures known as Ambulocetus and Rodhocetus made the transition. Fossil seashells trace the evolution of various mollusks through millions of years. Perhaps 20 or more hominids (not all of them our ancestors) fill the gap between Lucy the australopithecine and modern humans. And if all that isn't enough, there's definitive supporting evidence from molecular biology. All organisms share most of the same genes, but just as evolution predicts, the structures of these genes and their products diverge among species just as you'd expect from their evolutionary relationships. In fact, geneticists even have a technique that produces what amounts to a "molecular clock" that shows when various organism split off from earlier branches to form new species. PS. This just in. Another transitional fossil between reptiles and mammals found. Stay tuned for more news as it happens. Film at 11.
where did you go? My life is far less informative now that you haven't posted in a while. Life is a banquet for an open mind. A closed mind can only consume itself. Here's a transitional fossil for you! 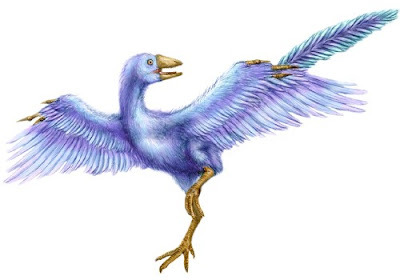 Is Archaeopteryx the ancestor of all birds? No, Archaeopteryx is a bird because it had feathers, but it has a lot of characteristics of dinosaurs that aren't found in modern birds. For that matter, it has a lot of characteristics of birds that aren't found in dinosaurs. Feathers, for example, are not a unique feature of birds. Archaeopteryx an example of a group in transition. kind of on the sidelines in the dinosaur to bird transition, but one that helps illustrate the evolution of the birds and shows that such a transition is possible. In other words, Archaeopteryx isn't THE ancestor of all birds, the transitional species, but an example of how birds emerged from dinosaurs. The first birds had more "reptile"-like characteristics and modern birds to have less, which supports their derivation from theropod dinosaur ancestors, and shows they're not just a variation "within kind."